Preheat your oven to 425 degrees. Mix 2 tablespoons oil, garlic, oregano, paprika, zest of the lemon, 1 1/2 teaspoons salt, and 1/2 teaspoon freshly ground pepper into a paste. Rub the mixture all over the chicken thighs, including under the skin. Toss the potatoes, onion, and Brussels sprouts with the remaining 2 tablespoons of oil and 1 teaspoon of salt. 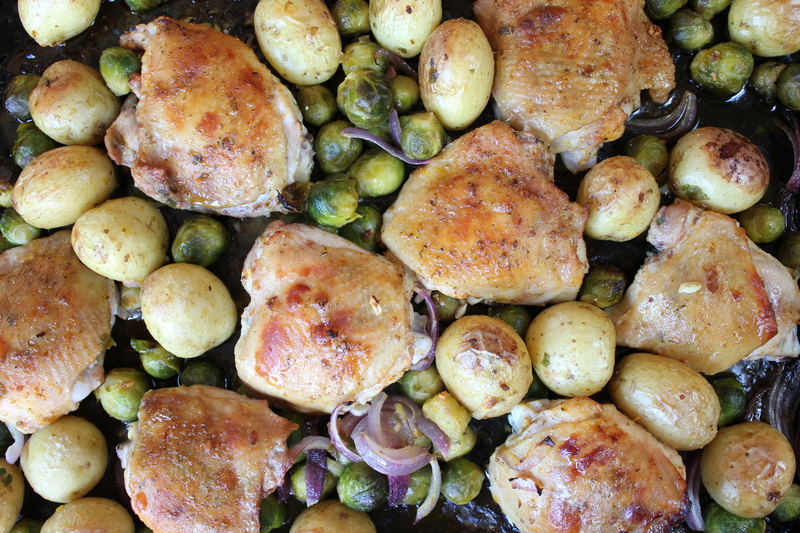 Dump the potato mixture on a large sheet pan. Nestle the chicken thighs down into the potato mixture, skin side down. Squeeze the juice from the lemon over the top of the chicken and potatoes. Slide the pan into the oven and bake for 30 minutes. After 30 minutes, remove the pan from the oven, flip the chicken thighs, and baste everything with the juices in the pan. Put the pan back in the oven and bake for an additional 20-30 minutes or until the chicken is cooked through. Thanks for the inspiration, Karen! We made this tonight and it was delicious, great flavors and easy filling meal after a hard day playing. We’ve been eating a lot of kitchen sink too lately so this was perfect for Sunday dinner! I love roasted chichen but don’t use thighs. I am going to do this! Yum. Sounds great! Perfect timing for this change of weather. It looks delicious! Looks like the perfect quick dinner! I adore brussel sprouts so I might have to make this meal this week. I added some sweet baby bell peppers and some extra garlic, then put a pat of butter on each thigh….simply delicious! Sounds great. Nice summer adaptation!